To some people—and to nearly all devoted readers of the Spot Cool Stuff travel blog—that equation is one of the immutable laws of the universe, as unbendingly true as E=MC2 or I think therefore I am. But for how long has that been true? And what exactly is it about taking a trip that makes us happy? And what can travelers do to prolong that happiness? • The single happiest moment of a trip is the initial arrival at the destination. • Five to seven days into a trip people start actively thinking about their work and life at home. • The length a a trip has no impact on the happiness it brings to your life. Great infographic with a ton of info. Love their ability to communicate info and entertain. A great infographic. Loving their ability to communicate info and entertain! This one in particular packs in so much info it’s amazing. This is interesting, I can absolutely believe and relate to the pre-departure excitement. I am always so stoked planning my trip, usually it doesn’t work out as smoothly as I hoped. But still very relaxing and fun to get lost and feel free! 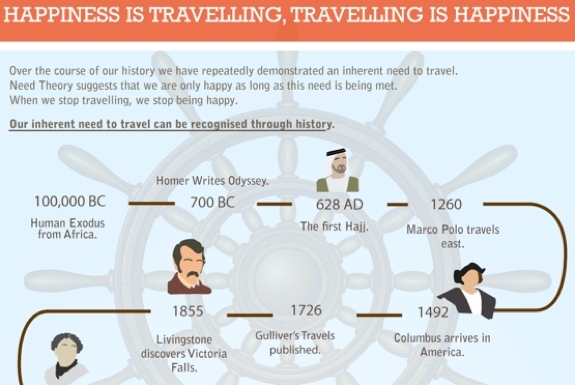 That is some good information about traveling and happiness. Thanks.